Another month, another walk through the untamed pastures of E2. As an accompaniment to these pictures you should take a look at this set of notes from a recent lecture on construction progess. Last month's photos are here. 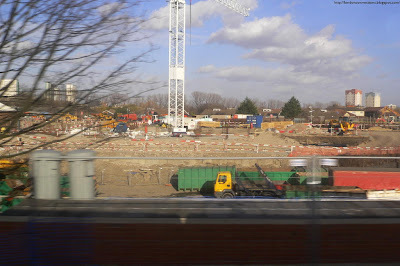 Dalston Junction, this time from the north end. This was all still bare earth at the beginning of the year. Haggerston station. Moulds for the concrete have been put up, ready for pouring. The lecture notes mention that they were forced to demolish the viaduct here, as it was structurally unsound. Hoxton station. 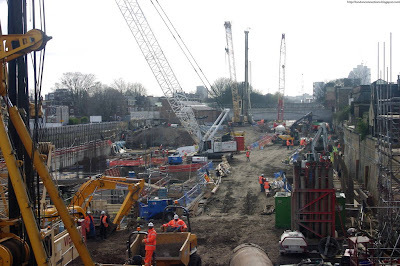 I'm no idea what this is the foundation of, as the station is meant to be entirely under the arches, but they seem to be making good progress whatever. On the right, the arches have been cleaned out. 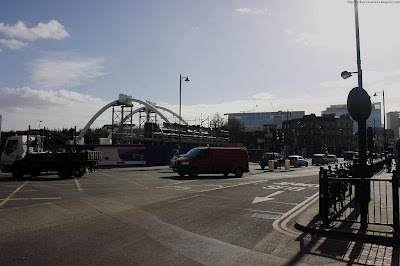 This is part of the curve from the end of the Broad Street viaduct to the crossing of Shoreditch High Street (see map). Since my last visit they've closed off Holywell Lane, creating one continuous building site for the length of the new viaduct. The pillars have been there a couple of months, so the closure and the scaffolding going up suggest they're about to do the deck. The new Shoreditch High Street bridge is taking shape in Bishopsgate Goods Yard - it's gained arches but is missing its vertical tension bars. The concrete has been cast for the eastern abutment, and it's now wrapped in black plastic (above the red van). The western abutment (just out of shot to the right) is still bare rebar. Allegedly it'll be moved into place this month. The bridge is bigger than it looks here - a diagram I have shows the arch as 11m high and 36m across (shorter than the similar 45m Regent's Canal bridge), and it will be positioned around 6m above road level. 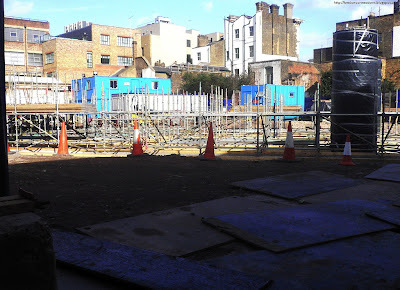 At Shoreditch High Street station, they're busy pouring the slab for the viaduct deck. 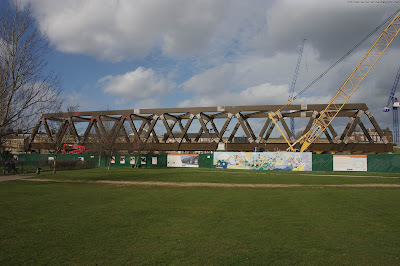 The replacement GE19 bridge is now fully assembled - the bench in front of the hoarding gives a sense of its epic scale. The bridge will be pushed into place at the beginning of May. 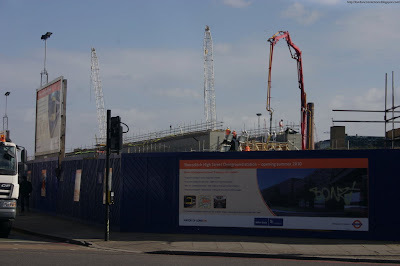 Part of the huge depot construction site at New Cross Gate. 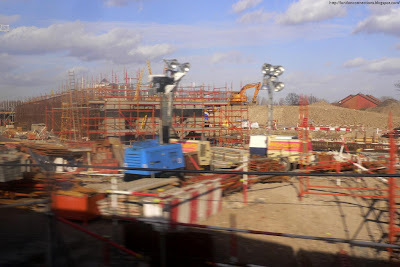 This was taken from a moving train - there's a lot more going on than was captured in this picture. Northbound trains heading for the ELL will cross the mainline on a flyover, descending this ramp within the depot site. I didn't get a picture of the activity on the west side of the tracks, where a similar ramp is being built and the bridge itself is being assembled. The bridge is similar in design to the GE19 bridge above, though only the deck and a couple of uprights are in place. Also like the GE19 bridge, it will be moved into place in May. 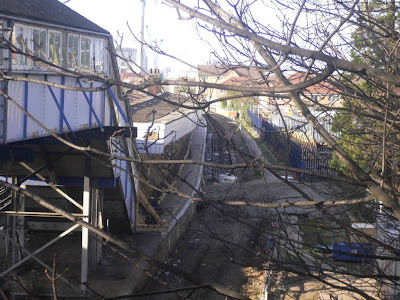 The old ELL platform at New Cross Gate, which has lost its conductor rails and buffer stop. This track will become the through line for southbound ELL trains by connecting it to the main line south of the station. Hey - thanks for this. Stumbled upon your site and now its securely bookmarked! I wondered if you knew where specifically the new stations of Hoxton and Haggerston were going to be located. Specifically Haggerston - TfL's brochure materials state that it will be running along Frederick Terrace and the park (ie. north of Lee Street) whereas other sites say that it will be using the old platforms from the North London line, of which the platform is still in place south of Lee Street and effectively running between the parallel streets of Acton and Stean. Any insight? Trains for the new ELL - if they are using the old North London Line tracks, then this is at a different gauge to LU trains, yes? Do you know what the new trains for the ELL will look like? Haven't found detailed diagrams of where those two will be, My understanding is Hoxton lies between Dunloe and Cremer Street with the etnrance at the Cremer Street (south) end. 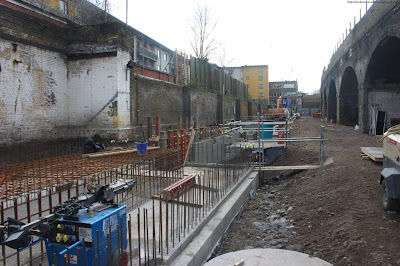 At Haggerston they've demolished a section of viaduct noth of Lee Street and it's likely the entrance will be there, with the platforms lying north. They can't reuse the old platforms, since they're having two tracks rather than the four before. The ELL will use normal Electrostar trains as used by Southern, Southeastern and c2c. The "tube" trains on the old ELL and mainline trains are the same size, give or take the odd inch. This is a useful site. The East London Line Extention is an overdue necessity for transport links for South to North London. I hear 2011 is now the proposed opening of the Link. Could be a last minute thing just before the Olympics due to open. No politician has ever shown any serious interest in such a development until we won the Olympics. I look forward to the further developments of the project. Thanks. 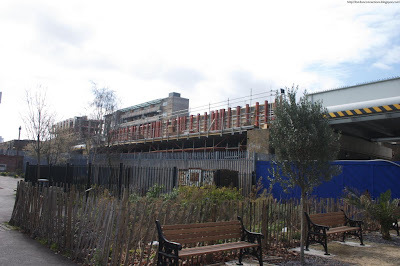 Any chance of the east facing chord at Dalston Junction being restored in time for the olympics? The route is short, protected and just needs track and signalling. If this was built then Overground ( ex- ELL ) services from south London via the east end straight to Stratford for the olympics become a reality.